Pumpkin (or squash) and sweet potatoes are two more ingredients that I find that I think about when planning a holiday dinner and I like to try to include them as often as possible. This year I knew that I would be using some sweet potatoes in the dessert so I wanted to include some pumpkin or squash in the main course. Since I already had some sage for the parmesan and sage roasted turkey and some gorgonzola in the blue cheese green been casserole I got to thinking about this roasted butternut squash and caramelized onion pizza with gorgonzola and crispy fried sage that I had made a while ago and liked so much. I figured I could take all of the ingredients of the pizza and turn it into a really tasty side dish. The recipe that I came up with is a little bit time consuming but pretty straight forward. You start by roasting the butternut squash until it is nice and tender and slightly caramelized and then you slowly caramelize some onions until they have browned and become super sweet. Next you brown some butter and fry some sage until crispy and then toss every thing in the browned butter. The sweet roasted butternut squash and caramelized onions went so well with the tangy blue cheese that was just starting to melt and become even more creamy and good! Overall this ended up being a really tasty side dish that I will be making again. Toss the butternut squash with the olive oil and season with salt and pepper. Roast the squash in a preheated 350F/180C oven until tender, about 30-40 minutes and set aside. Meanwhile, heat the oil and melt the butter in a pan. Add the onion and cook on low until caramelized, about 40-60 minutes. Add the garlic and saute for a few minutes and set aside. Melt the butter in a pan and let it brown. Add the sage leaves and saute until crispy, about 2-3 minutes. Add everything to the pan and toss in the browned butter to coat and remove from heat when the gorgonzola starts to melt. Love what you made Kevin. Caramelized onions & Gorgonzola go so well together. I love the flavors in this dish. Thanks so much for sharing it. WOW – love the ingredients- I am sure to love the dish! Perfect for fall! Thank you! Wow, this looks absolutely fabulous! Kevin – I roasted up some butternut squash myself last night to go with parmesan & couscous…I think the squash I have left will be used for your recipe! Four of my favorite things on one plate! you had me at caramelized onions, but add in everything else and oh my god! You should try this if you like the flavor combination. I AM CLAPPING OUT LOUD OVER THIS ONE !!!!!!!!!!!!!!!!!! Ooooh, this sounds good. I love squashes and pumpkins in the fall. By some miracle, I had all of this on hand and made it for dinner tonight with some fresh spinach mixed in. It was absolutely delicious- thank you! I'll take any leftovers please! That is one fantastic pumpkin dish! Those flavors are terrific! Just YUM! I'm a sucker for Gorgonzola and I love when it's paired with sweeter veggies like butternut squash and the caramelized onions. Great recipe. This is a wonderful addition to my pork tenderloin meal tonight……you might even have given me an idea for a pizza topping…..butternut and gorgonzola!!! You always manage to hit the spot for me, when it comes to food Kevin and this is no exception. I bet this combination was gorgeous on the pizza! What a tasty dish,…looks so delicious, Kevin!! I don't think I can wait until Thanksgiving to make this. I might have to eat it every day for the rest of my life. 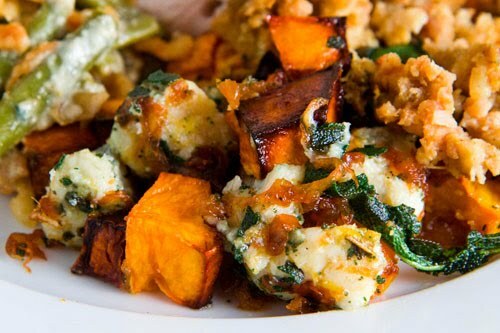 Sage and butternut squash are always the perfect combo, sounds delicious! Oooh, I am definitely making this dish this weekend – I have all the ingredients in the house…and I got hooked on sweet potatoes with blue cheese last fall, and this looks even better! YUM! Oh Kevin, I'm making this!!!! That's just gorgeous! I can imagine it was delicious. oh my goodness, so yummy! i love the gorgonzola! Everything tastes better with a bit of gorgonzola dolce … numnum! That looks yummy! Finally I know what to do with the pumpkin on my shelf. This looks and sounds absolutely amazing. I love butternut squash especially with sage and onions or shallots. Thanks for the recipe!! Yuumm..that looks soo good. I have a butternut squash waiting to be cooked and this looks like a great recipe! Will definitely try it. Thanks! You beat me! I was totally going to do a butternut squash and gorgonzola casserole. I LOVE the idea of fried sage though. That totally takes it one step further. I opened this and actually said out loud "oh my goodness!" That looks absolutely amazing! Yummy! Will you send me some of this? Like, now? Looks awesome. This is truly gorgeous! You are making me hungry. This looks perfect for all. I love squash! OMG. It took me about .5 seconds to bookmark this. I was going to eat leftovers tonight, but I might just be eating this instead!! THANK YOU!!! This is a very nice vegetarian dish, looks fantastic! It looks simply divine! Nicely done Kevin. I love this combination of yours..I'm curious about those crispy sage..
Really great…and I hope it makes it to my Thanksgiving table. This looks fantastic — I make something similar (with leeks instead of onions and goat cheese instead of blue) and I always recommend it to friends looking for a great substantial vegetarian dish for Thanksgiving. Had butternut ravioli a couple months ago. The gorgonzola saved the dish, and having the two together led to one of those Ah ha! foodie moments. This looks delicious – how creative! THis is very drool worthy Kevin. I have a ton of sage in my garden. Always looking for something to use it in. I knw I'm a little late to the party, but I couldn't help but comment. I have 2 butternut squash (squashes?) in the refrigerator waiting for a grander purpose than taking up much needed shelf space. One is destined for butternut squash soup, but the other one was a wild card. Until now! Thanks for the recipe! What an amazing combination of sweet and salty in this dish…the crispy fried sage is the icing on the cake! I made this with pumpkin instead of squash and I didn't have sage on hand, so I used oregano. The herb frying up in butter filled the kitchen with such an aroma! It was a wonderful greeting for my sister when she arrived home. Thanks for teaching me a new technique! I had roasted the pumpkin and caramelized the onions ahead of time so dinner came together in a snap. Made this recently and it was wonderful. Plan on making it again for Thanksgiving. Your blog was the first place I looked for inspiration for Thanksgiving, and I found it as I knew I would. Though I could live on your dips. Wow this looks good. This is on my must try list! I've made this recipe three times and have passed it along to friends and family. A perfect winter side dish. OMG!!! !Is all I can say about this.Definately going onto our list of traditional foods.This was fantastic.Got a lot of compliments of this!!! !Squash with onions and gorganzola?Who knew!!!???Awsome! I made this for Thanksgiving and it was delicious. Lots of compliments on it from my gourmet, hard-to-please family. Love this! I have been drooling ever since I stumbled onto your site. A few of your recipies are making it to my Christmas table this year. I made this for dinner last night, and it was fantastic! Thanks for the delicious recipe! This would also make a really nice risotto, don't you think? Anonymous: These flavours would work really well in a risotto! making this tonight! can't wait for it to be in my belly! I made this last night for Thanksgiving, and it was a HUGE hit! Everyone loved it and lots asked for the recipe. Two additions I made that I would recommend: add roasted asparagus, and serve over risotto. I found some butternut squash flavored risotto, but I imagine most flavors would work. This dish is wonderful and I will most definitely make again!!! Thank you for posting! YUM! Caution: don't over cook the squash. Though it still tasted awesome, mine did not stay in cubes. I did save energy though, by caramelizing the onions in an iron pan in the oven along side my pan of squash. This was amazing! my whole family agreed it's going to be a regular at Thanksgiving dinner. I caramelized the onions using the slow cooker (a Debbie Koenig technique. http://www.parentsneedtoeattoo.com) Totally awesome.